giving proper attention to your diet routines and avoiding the use of junk hair oils and soaps. The only thing you need to remember is patience because this is not an instant miracle but it needs time and proper caring to develop thick and healthy hair. Obviously, genetics also plays an important role that you cannot control in shaping your hair buildups but by proper and regular care, you can have beautiful and thick hair. Vitamins are the main nutrients in shaping your hair healthy and thick, some important vitamins are vitamin C, vitamin E, biotin and vitamin A. Vitamin A serve as a natural body oil that minimizes the roughness and brittleness of hair, vitamin C contains antioxidant properties that makes your hair shaft strong and healthy. Vitamin C also decreases the formation of split ends in the hair as well. The main purpose of biotin is to eliminate the possibility of hair loss while vitamin E ensures proper blood circulation in your scalp. You can easily maintain your vitamin intake with the help of a diet chart. Water is one of a few miraculous things silently do wonders in our body and therefore therapists and professionals always advice drinking plenty of water regularly, water is the main source for keeping your body sufficiently hydrated. Lacks of proper hydration is the main cause behind hair dryness and brittleness therefore, drinking plenty of water daily ensures healthy and thick hair. Experts suggest that drinking 2.5-3.5 litter of water in a day is enough for keeping you properly hydrated. Therefore, you can keep your hair in healthy condition by drinking plenty of water daily. You can avoid split-ended hair by regular trimming, daily trimming not only eliminates dull and split ending of your hair but also prevents them in reaching follicles as well. Hair conditioners helps your hair to grow strong, thick and smooth, hair conditioner provides miniaturization for your hair follicles by creating a layer that prevents hair brittleness and hair damage. Hair conditioner contains humectants whose main purpose is to absorb moisture from the air and pass this moisture to your hair shaft to make your hair thick, smooth and healthy. Therefore, use hair conditioners in proper intervals for making your hair shiny and thick in volume. Using iron, hair dryers to flatten up your hair or making your hair curly is not a wise idea because these equipment absorb moisture from your hair and result in making your hair dull and brittle. The best way to dry your hair Is by drying them in natural way. By adopting few simple things as shown above you too can have healthy, thick and smooth hair. 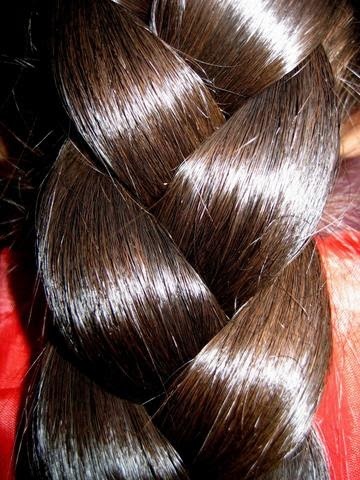 bigger knots, you can make long strokes from the scalp to the end of your hair. It's also best to use a wide-toothed comb first and then a fine-toothed one. Sun damage, chemical damage, pollution, poor dieting and even brushing your hair damages is it to a certain extent. The amount of breakage depends on your hairs hydration. Conditioning replenishes the hydrogen bonds, which in effect, makes the cuticle stronger. Sure direct heating is very injurious to hair. Because, it weaken the growth of the hair. Benefits of Garlic for Breast-Feeding Mothers..